The Tazaungdaing festival, also known as the “Festival of Light,” is celebrated for several days in November all over Myanmar in the days leading up to the full moon day of Tazaungmone. It also marks the end of the rainy season, expected to be around the November 21 full moon sthis year. A nationwide holiday, it is also the time for monks and Buddha images to be offered new robes in a ceremony known as “Kahtein” or “Kathina”. The merit one achieves from the offering during this time is said to be greater than that at any other time. Teams of weavers compete to weave the robes to be offered to the Buddha images the next day. The robes are called mathoe thingan, meaning, ‘before food spoils’ because the weaving should be completed before the evening’s food goes bad overnight. Ceremonies are held at most of the pagodas throughout Myanmar, especially at the major pagodas like the Shwedagon in Yangon. Around the country, in the evening after the full moon, temple goers are customarily treated to a salad of “mezali” flower buds. This treat, tasting a little on the bitter side, however is believed to protect one from 96 kinds of diseases! 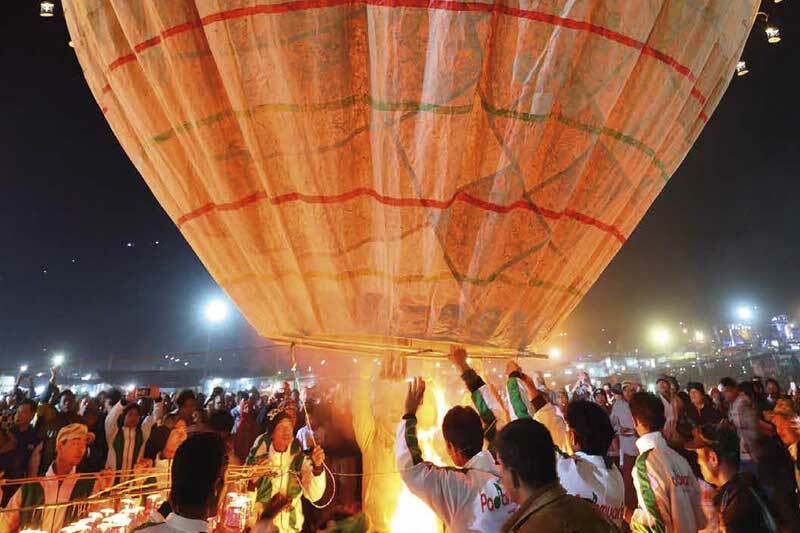 In the Taunggyi region of the Shan State, a traditional hot-air balloon festival is widely celebrated. Starting seven days before the full moon, two types of balloons are floated: daytime balloons and large night balloons made with handmade paper crafted into animal figures. Locals as well as folks from other parts of the country come to Taunggyi to partake in this delightful event.